For our visitors to the Island, St Margaret's Church is easily accessible by public transport. The local bus company will drop passengers on request, at the bus stop at the corner of Hayles Avenue and Endeavour Road.It is a short stroll of about 100 metres along Endeavour Road, where you will find the Church located on the left. The Magnetic Island SunBus timetable can be viewed by clicking here. Sealink's ferry timetable can be viewed by clicking here. We gather as a faith community on Saturday evenings. Fellowship April to September from 4.30 p.m. to 5.00 p.m.
During these times we listen to and reflect on scripture, pray for those who need support, worship God in song and remember our Saviour Jesus Christ as we celebrate the Eucharist. From time to time we enjoy special family services and evensong. Should you have a request for prayer support, please contact the resident priest before the service on telephone (07) 4778 5628. 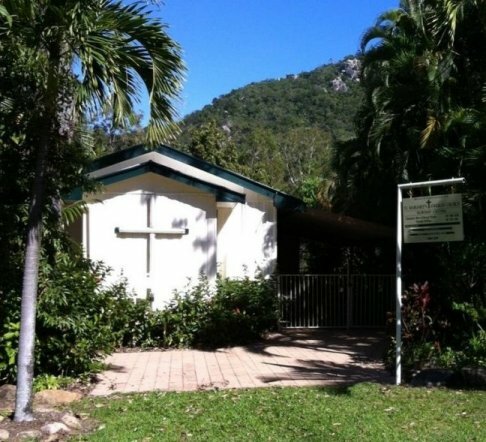 St Margaret's Anglican Church is blessed to be located at Alma Bay on one of North Queensland's most beautiful tropical islands. The natural environment is incorporated into what we do as much as possible and we welcome as family the many visitors who come from various parts of Australia and overseas to holiday here. As the front door is approached curlews may be seen in the garden and kookaburras and cockatoos in the trees above. Then once through the door, in the peace and tranquility inside the air-conditioned church, the bush and hills that can be seen through the large sanctuary window become a focus for prayer and meditation. It is natural in this environment that many of our activities spill over into the outdoors and for those wishing to relax with a good book our free library is open every day and can be found under the annex. St Margarets tries to maintain a link with the Island community, Especially those in need, as well as those who are further afield in the world, by organising and participating in such activities as blessing the animals, Lego competitions and fundraising for drought-stricken farmers, sick children and the disadvantaged in Nepal. The St Margaret's community rejoices in being a part of many special family occasions. The Island makes a very convenient and enjoyable venue for these gatherings and many choose St Margaret's for weddings and baptisms. Others choose to marry on the beautiful Island beaches. Some return to renew their wedding vows. Please contact the resident priest for more information on blessing your marriage or baptising your child at St Margaret's. At the conclusion of each School Year an Ecumenical Christmas Carol Service is held at Alma Bay and the Island community and visitors are invited to join with a combined churches choir in singing traditional and Australian carols to music provided by a Townsville brass band. A highlight of the evening is the presentation of a pageant telling of the Christmas story by the children from the Island School. Carols by Candlelight is usually held at Alma Bay during the last week of the school year. Similarly visitors are invited to join the Island Community as we gather around the memorial at Alma Bay to honour those who have fought so selflessly and bravely for freedom and peace in the world. Anzac Day commences with the sound of feet marching to bag pipes and drum beats in the dark from the RSL Hall down the road to Alma Bay and concludes with the Dawn Service at the memorial as the first rays of the sun stretch across the sea to the wreaths that have been laid in remembrance. This service is well attended and visitors from Townsville travel to the Island on a special ferry to participate in it. A Remembrance Day Service is held, again at Alma Bay, on 11 November to remember all servicemen and women who have sacrificed their lives for us. The story of the English princess who was to become Queen of Scotland and later St. Margaret begins in Hungary. She was born in that country in 1045 while her family was in exile. In 1057, however, circumstances in England were such that she and her family were able to return home only to find they had to flee once more. This time Margaret found refuge in Scotland. Around 1070 Margaret married Malcolm III of Scotland and became his Queen. Their home was Edinburgh Castle and there they brought up their eight children, six sons and two daughters. Margaret's youngest son, David, who later became David I of Scotland, was influenced strongly by her and was himself canonised. Margaret was known as a just queen and a reformer; she strongly influenced her husband, Malcolm, the court and the church. Margaret was a holy woman and became renowned in her lifetime for her charitable works and service to orphans and the poor, spending many hours attending to those in need as well as reading the scriptures and praying. Her chapel in Edinburgh castle is maintained to this day. Margaret died in 1093 at the age of 48 and in 1250 she was canonised in recognition of her personal holiness, fidelity to the Church, work for religious reform and her acts of charity. Our community of faith is honoured by her patronage and celebrates the feast of St Margaret on 16 November each year. In attempting to write a history of St Margaret's at Arcadia, one has to rely to a large extent upon the memories of our older members. Records for historical purposes were never required during the formative years so many dates, decisions and so on, are not precise. None of the original decision makers are still alive. However, an attempt has been made here to give a picture acceptable to present worshippers as well as to visitors of long standing, past and present. Immediately after the war a regular service was held on the front verandah of the home of Mr and Mrs Ray Henry, Dent Street, Horseshoe Bay. As the nation was rebuilding in the 1950s, one, Archdeacon Bill Hohenhouse was able to buy a barracks building from the Forts area of Florence Bay. This was erected at Endeavour Road, Arcadia, on land already owned by St James Parish and it was to become the present St Margaret's Church. It is conceivable that the land was given by the Hayles family in the 1920s when they subdivided the old Rheuben Estate which comprised practically the whole of Arcadia as we know it today. So the building was adapted as a church, furnished as a church and regular services were held at St Margaret's, eclipsing the little church at Picnic Bay and the front verandah of the Henry house. On his retirement from St James Parish, Archdeacon Hohenhouse, who came to live on Magnetic Island, brought the daughter church of St Margaret under his guidance and care. No church can function properly without its friends. St Margaret's was no exception. From the beginning the church has welcomed and benefited from these friends. The surrounds were kept in trim, a lawn was planted, and garden beds were dug and processed. St Margaret's Ladies Group. St Margaret's has, over the years, had a unique band of women members of the Ladies Group to take care of its fabric, finances, functions and morning tea, fetes, church maintenance, its vestments, linen, and in fact everything necessary for its upkeep. St Margaret's Remodelled. In the 1970s a request for a shaded area to be used for occasional meetings, morning tea and a place for a Sunday School, was made by Joyce Heselton. A band of men – Arthur Wynn, Graham Rich, Bert Humphries and the writer (Tom Wetherell) – decided to alter and improve the building. St Margaret's had been given the altar from the then defunct Seaman's Mission in Palmer Street, Townsville. This altar was one where the celebrant faces the congregation, so the new altar set the pattern for a rebuilding of the sanctuary. The glass panel at the rear of this area was presented by Arthur Wynn – a left over from cyclone Althea 1971. The old broom cupboard behind the hymn board was turned into a toilet, a new vestry was incorporated on the other side and a lean-to shaded area was built on the northern side and paved with cement tiles. New altar rails, kneelers and padding completed the internal renovation. Pews were brought up to date with a platform for hymn books, etc, and hinged kneelers. The rear glass wall, where the congregation can gaze at the wooded hillside with its spectacular rock formations, is the 'piece de resistance', inspiring reflection on the mystery and wonder of creation and its beauty. Church Bell. This is a ship's bell and came to St Margaret's from the Hayles family who had provided ferry services to the Island for approximately eighty years. Bob, in particular, felt it would serve a useful purpose to summon worshippers each Sunday rather than being left to languish in a store room. It is with gratitude that the St Margaret's faith community continues to be benefitted by the Hayles family trust. During these years, Norm Strambini made and added the wooden cross that stands against the glass panel behind the altar and Bligh Hall made the built in cupboards in the vestry and a second prayer desk. Outside a large cross that is illuminated at night was placed on the front wall of the church and the undercover area was fenced. The front yard was opened up to the street by removing the gate and fence and, at the same time, the garden was remodelled and the lawn was replaced with paving. In recent years a disability access ramp has been added to one side of the church.